In honor of ALL of you, I am hosting a Customer / Fan Appreciation Week, and YOU are invited to join in on the fun! I am offering two of my latest Halloween figurine designs that will debut this fall from Bethany Lowe Designs! These fresh and fun sample pieces are signed by me and will be shipped to their lucky winners! 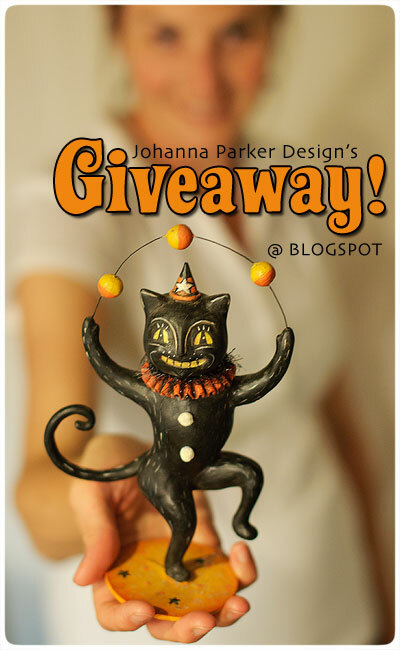 My Juggling Black Cat is up for grabs HERE via my BLOG, while my Balancing Jack-o'-lantern is being offered on my Facebook Fan Page. break down 2003, and you get 20 + 3 which equals 23! Many of you came so very close to this number, but only one person nailed it! "still going with #23 and I just love your work!" Many THANKS to ALL of you for playing along :) I truly enjoyed reading all of your thoughtful comments, and they made me smile!!! * Simply leave a comment below with your best guess as to which number it is and include a few words regarding why you want to win! * Follow my Blog (top right) for another entry with another guess. * Share my Giveaway news via your favorite Social Networking sites for a third chance at guessing! * Pin the above image on Pinterest for yet another guess! Have FUN with this and spread the word for more chances to enter! PS: See the post below for a sneak peek of the sweet Jack-o'-Lantern image I am offering on my Facebook Fan Page! Entries to win that fun character will be accepted via the comments section on Facebook only.